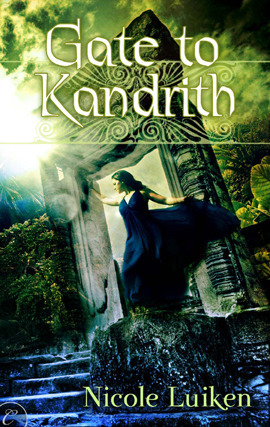 I have been digging Nicole Luiken’s Kandrith novels of late; I already reviewed Gate to Kandrith and I just finished Soul of Kandrith, which was the first book I ever preordered for my Kindle. I just loved these books so I was thrilled to do this interview with Nicole. Although these books are labeled fantasy romance, they are fantasy first, in my mind. She is the author of eight published books for young adults, including Violet Eyes and its sequel Silver Eyes, Frost, Unlocking the Doors, The Catalyst, Escape to the Overworld, Dreamfire and the sequel Dreamline. She also has an adult thriller, Running on Instinct, under the name N.M. Luiken and a fantasy romance ebook, Gate to Kandrith. Would you tell us a little about Soul of Kandrith? 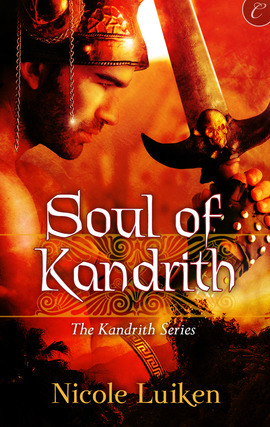 Soul of Kandrith is the second book in a epic fantasy series. Although there is a strong romantic subplot, the main plot is fantasy. Kandrith is a tiny country created by magic and founded by ex-slaves that exists in the middle of the corrupt Republic of Temboria. At the beginning of Gate to Kandrith an uneasy peace exists between the two because of the Hostage Pact. Soul of Kandrith deals with the consequences of the end of Gate to Kandrith, the breaking of the Hostage Pact and the more personal ramifications of Sara’s sacrifice. Kandrith has a one-year reprieve before the Republic of Temboria invades again. Lance is sent on a mission to encourage a rebellion in one of the Republic’s conquered provinces. Because of the Republic’s many Legions, the rebellion is doomed unless Lance can teach the rebels magic and even the scales a little. But, of course, there are complications, one of them being Lance’s determination to help Sara get her soul back. At their heart, both Gate to Kandrith and Soul of Kandrith are about slavery. How long did it take you to write Soul of Kandrith? I started the first draft of Soul of Kandrith as part of nanowrimo in 2009, but had to continue into December to finish. The novel then lay fallow until I received word that Gate to Kandrith had been accepted for publication. I wrote the 2nd and 3rd drafts in an over-lapping fashion from August 2011 to June 2012. Then editorial revisions in August. In total I probably spent a full year writing it. Tells us about your favorite scene in Soul of Kandrith. Ooh, that’s tough. I have a certain fondness for the hard-boiled egg scene [in which the soulless Sara is indifferent to the pain of reaching into a pot of boiling water to bring out the eggs]–I think it’s memorable because it shows just how far to the left of center Sara has gone. I like action scenes, and I’m quite proud of the whole Legion at the Gate section and, of course, the climax. For romantic scenes I like the bath scene and the bargaining-for-kisses scene… I could go on and on. I sometimes think my goal when I’m editing is to make every scene a favourite scene. The first draft has a lot dull transition scenes that take the plot from point A to point B, and I work hard to transform those scenes into something enjoyable. Tia aside–I name my scenes too! That’s how I end up with chapter names. Can you tell us about any scene that gave you trouble? The first scenes with soulless-Sara were horrible to write. At this point, Sara doesn’t understand emotion, doesn’t feel pain and fear. I couldn’t even use the word ‘smile’ or ‘frown’, but had to rely entirely on visual clues like ‘his lips curved up’. And yet they were critical in giving the reader a tiny bit of hope for the future and in showing Sara’s growth throughout the book, how she slowly begins to experience emotions again, first mild ones such as irritation and liking then growing into hate and love. What draws you to writing epic fantasy? I love reading epic fantasy. My husband and I can endlessly discuss Jordan’s The Wheel of Time or Martin’s Song of Ice and Fire. I’m eagerly awaiting book of Sanderson’s The Stormlight Archive and am halfway through Rothfuss’s The Wise Man’s fear. I love entering new worlds and learning about their quirks and customs and magic. I had great fun coming up with Kandrith’s magic system. I was afraid to try my hand at epic for many years because I’m not good at description, something that is crucial for fantasy. (It’s not that I can’t write description, it’s that it feels like three times as much work as writing dialogue or action.) I eventually realized my problem was that I hadn’t put enough thought into the setting, that writing a description of yet-another smoke-stained inn with a beer-sticky floor and a pot of stew bored me because I’d read hundred of other stories with the exact same inn. The challenge then became to come up with something different: an inn that was also the Temple of Jut, God of Travellers. When you are writing, who is in control? You or your characters? For the most part I am. I plot my novels out before typing chapter one, but I’m a firm believer that if a character balks at a scene it’s a sign from my unconscious that I’ve taken a wrong turn with the plot–usually this just involves backing up a page and taking another run at it. However, one of my characters did give me serious trouble when I was writing Soul of Kandrith: the villain, Nir, high priest of the God of War. He ran roughshod over my outline and wrenched the plot into a much darker place than I had intended to go. The meeker way I’d asked him to behave in the outline was, quite simply, out of character. If you’re a beginning writer, let some time lapse between your first draft and your second. This will give you some emotional distance and allow you to come at revisions from a fresher perspective and with a keener eye. Nobody writes a perfect first draft. What authors or stories inspired you to write? The books that leave me inspired and eager to write are usually books about writing. I wrote my first book (at age thirteen) because I happened to take a book out of the library called Guide to Fiction Writing by Phyllis A. Whitney. How to Write Best-selling Fiction by Dean Koontz, Writing the Block Buster Novel by Albert Zuckerman are sources I’ve gone back to over and over. I also love the craft notes J.R. Ward included in The Black Dagger Brotherhood: An Insider’s Guide. My favourite SF and Fantasy authors are Lois McMaster Bujold, Jim Butcher and Patricia Briggs. I buy them in hardcover. My favourite romance author is Suzanne Brockmann. 9. The Kandrith series is a duology. Do you have any plans to write any more stories in this fascinating, pseudo-Roman world? I have a short story telling Rhiain’s origins that I’ve toyed with lengthening and putting up as a freeread, but for the most part no. The duology gives Lance and Sara a HEA and I wouldn’t want to upset that by writing another book. Plus, there are lots of other stories in my head clamouring for attention. 10. Is there anything you wish I had asked, or that you would like to add? Thanks so much for stopping by! I am still hoping to convince you to write other stories set in this world! More Lance and Sara, or something moving into the Qiph or Grasslander cultures? I actually enjoyed your pseudo-Roman culture and did not get enough! 🙂 I agree that Sara and Lance has their HEA, and to add any more to their story would belabor the point. I had a lot of fun inventing the gods and goddesses. Gate mostly explored the Goddess of Mercy and the God of Malice, so it was nice to show more of how War, Desire, Death and Fertility set up their temples. And we’re back after my hacking misadventure! It was definitely interesting to see more of the Republic. You definitely have an imagination for unique fantasy!